Puyo Pop fever is a colourful and frantic puzzle game first seen on the Nintendo Gamecube. Can this cutesy puzzler whip you up into a fever? Puyo Pop Fever is the latest in a long line of Puyo Pop games, the first of which appeared in the arcades way back in 1991. Like many classic puzzle games, the graphics have been tweaked slightly over the years but the core game play remains the same. With this DS conversion, courtesy of Sega, fans can now grab a slice of the Puyo Popping action on their handhelds. For those who have never played the game before, Puyo Pop is all about beating your opponent (either a computer controlled opponent or another human) by filling their screen with clear Puyos (also known as Nuisance Puyos). Puyos, small gelatinous creatures with eyes, fall from the top of the screen, usually in pairs, though sometimes in groups of three or four at a time. The player can rotate and manoeuvre the falling Puyos so that they land next to other Puyos of the same colour. When four or more Puyos of the same colour are aligned, they are removed from play. If you manage to cause a chain reaction, then several Nuisance Puyos are sent to your opponents side, giving them less time to react to newly falling Puyos. The game ends when one side fills up their entire playing area with Puyos. We're not sure why there is an "Onion Pixy" in the game. A new addition to the action in this version of the game is the "fever mode". As you make bigger chain reactions, your fever gauge slowly rises. When it is full, your playing area flips over to one filled with several Puyos all perfectly configured for a huge chain reaction. You're only given a few seconds to work out how best to set off the chain and doing well in fever mode can save you from the jaws of defeat. Gameplay takes place entirely on the top screen, with the bottom screen reserved for the cutesy characters to prance about on (not that you ever have time to watch them). It is possible to play the game with the stylus, although it is much quicker and easier to use the d-pad. While Puyo Pop has always been most fun played with friends, Puyo Pop Fever does have a solid single player mode too. There's "endless mode" where you play alone, with your only enemy being a steady increase in speed. There are also missions, similar to the quest mode in Tetris DS, where you must perform tasks such as bursting two different coloured Puyos at once. Finally, there is a fun story mode, which is probably the best way to play the game by yourself. The story mode follows the adventures of two cutesy anime witches, goody goody Amitie and arch rival and snob Raffine, as they search for Professor Accord's flying cane. Somehow, searching for this magical artefact involves playing Puyo Pop against a selection of cutesy opponents. The AI opponents can be particularly challenging. While most players will clear Amitie's levels, only expert players will see the end of Raffine's story. If you're the kind of player put off by bright primary colours and hyper happy music, then Puyo Pop Fever is probably not the game for you. The presentation, music and characters are high on the saccharine scale throughout. Puyo Pop Fever also has some excellent multi-player modes. Up to 8 players can compete, either by downloading from a single cartridge or by using their own copy of the game. Multi-player matches are frantic and extremely entertaining, especially with opponents at or around your skill level. There's no internet play on offer here but that's a minor omission, especially as half the fun is watching your opponent sweat as you set up another super chain reaction. 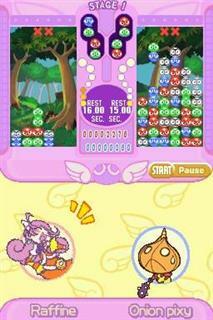 Puyo Pop Fever is a solid, well presented and entertaining DS puzzle game. Although not quite as complete a package as Tetris DS, fans of the series are still left wanting very little. If you enjoyed Puyo Pop on other platforms, or if you enjoy arcade puzzle games, you should put this game right at the top of your wish list. Feverishly good!